Dr Katherine Fender (St John’s College, University of Oxford) discusses the ways in which the notion of the ancient Welsh “bard” was invoked in the eighteenth and nineteenth centuries. Six months ago, Dr Liz Edwards contributed a brilliant piece to this blog (entitled “Four Nations Romanticism and Welsh Writing in English”), which focused upon the verse of an eighteenth- and nineteenth-century Welsh writer, Richard Llwyd – who is otherwise known as the “Bard of Snowdon”. This blog will focus upon a related theme, which might similarly be categorised as research into Wales, Romanticism and poetry. Rather than looking at Welsh writing in English, though, I will be looking at English writing which was heavily indebted to Welsh figures, forms, mythology and landscape. Specifically, I will be considering the notion of the ancient Welsh “bard” and its popularity in the eighteenth and nineteenth centuries: a figure to be invoked, if not ventriloquised, by many artists and writers in the Romantic period. Why was the bard – together with the landscape of Wales, including sites such as Snowdon – regarded as such as a rich resource for writers in the eighteenth and nineteenth centuries, and beyond? In particular, one might wonder why such overtly Welsh images were so popular with English language writers in the Romantic period. Llwyd’s epithet – the “Bard of Snowdon” – conveniently encapsulates the sublimity of both poet and landscape: essential components of what I shall introduce as the Welsh or Bardic Sublime. This is a scene which is recreated time and time again in eighteenth-century art, and one which marks the inception of a new model of rhetoric in the period: a subject which endures into the nineteenth century, as illustrated by the preceding image which was completed sixty years after Gray’s poem, dating from 1817. At the heart of this form, and at the centre of these texts and images, stands the figure of the ancient Welsh bard. Bards were heroes of sorts in medieval Welsh society: a bard would serve as a panegyrist, an oracle, and even sometimes a warrior. The theme of Gray’s poem itself bears testament to the Welsh poetic tradition of vaticination, prophecy or, as it is known in Welsh, canu darogan. As James A. J. Wilson asserts, Gray’s Bard is granted “the prophetic voice, cursing the line of Edward and presaging various future miseries, all couched in the obscure and symbolic language characteristic of such prophecies.” The legendary massacre of the bards on instruction of Edward I, upon the English conquest of Wales in 1282, constitutes the main act of national betrayal in Welsh cultural memory. The bards were supposedly killed by the English for fear of their prophetic power and in the belief that they would incite national rebellion as cultural symbols of Wales: as keepers, or vessels, of cultural history. But, as Sarah Prescott writes, “even as the bard sings about the end of poetry, he and his poem attest its survival”. The bard is a unifying force, reconciling the tripartite temporal scheme of past, present and future by inducing the reimagining of cultural memory in the present, underpinned by a prophetic confidence in cultural resurgence. One may relive the terror of bardic demise, mitigated by the distance of time, as well as delight in the inevitable return the bards themselves prophesise. To make any thing very terrible, obscurity seems in general to be necessary…the druids performed all their ceremonies in the bosom of the darkest woods, and in the shade of the oldest and most spreading oaks. 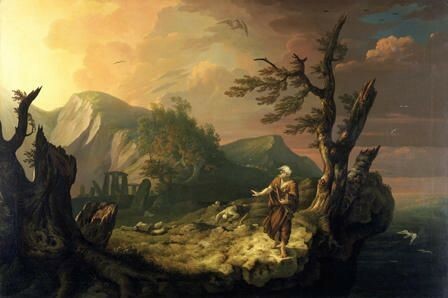 Ideas and images of the Bardic Sublime cater generously to the category of the obscure in the eighteenth century, as Burke himself recognised. 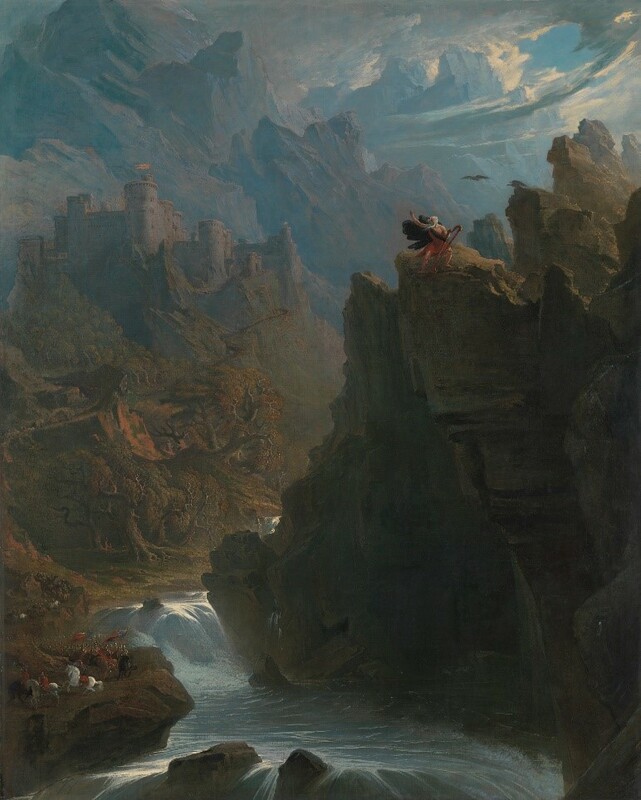 Moreover, the Bardic Sublime constitutes a form of poetic rhetoric: one which foregrounds the affective and imaginative qualities that are associated with the ancient Welsh bard, who is depicted as the prototype of the modern bard or poet in Romantic verse. Snowdon, revered as a site of sublimity by many Romantic writers, features prominently in English-born Felicia Hemans’ Welsh Melodies (1821). One poem, “Eryri Wen” (“White Snowdon”), specifically focuses on the mountain as both a symbol of the sublime and of the bardic. Snowdon is described as “Monarch-hill”, “holy ground”, “mountain-throne”, “temple of the bard”, “fortress of the free”: a site of eminence, power, holiness, and inspiration. Hemans even invokes mythology linking Merlin with the mount: “the awful spell / Yet holds unbroken sway, / As when on the wild rock it fell, / Where Merddin Emrys lay!”. Snowdon, and Welsh landscape, are presented by English writers such as Hemans and Gray as alternative – but equal – sources of inspiration to those from classical history. This book links the literary and intellectual history of England, Scotland, Ireland and Britain’s overseas colonies during the late eighteenth and early nineteenth centuries to redraw our picture of the origins of cultural nationalism, the lineages of the novel, and the early literary history of the English-speaking world. Where is Wales? From the outset of her Introduction – when presenting the figure of the bard through whom she goes on to define and elucidate eighteenth-century conceptions of cultural nationalism – Trumpener immediately invokes Welsh sources: Evan Evans’ poetic representation of the massacre of the Welsh bards by Edward I; Edward Jones’ 1784 text outlining the bardic role and responsibility to protect and to prompt engagement with national memory. After this point, though, when the ancient Welsh bard has served his purpose in Trumpener’s introduction to the bardic, reference to Wales and to the Welsh aspects of the eighteenth-century bardic tradition disappear almost completely. The Welsh bard is, once more, rendered but an echo. My research endeavours to resurrect the figure of the ancient Welsh bard. James A. J. Wilson, “The Orator, The Prophet, and the Bard: Three Eighteenth-Century Prophetic Voices”, (British Society for Eighteenth-Century Studies conference paper, 2005), pgh 9. Available online at: http://users.ox.ac.uk/~lady1262/BSECSpaper2005.html, accessed on 05/03/18. Sarah Prescott, “’Gray’s Pale Spectre’: Evan Evans, Thomas Gray, and the Rise of Welsh Bardic Nationalism”: Modern Philology, Vo. 104, No. 1 (August 2006), p. 81. Available online at: http://www.jstor.org/stable/10.1086/510263, accessed on 05/03/18. Edmund Burke, A Philosophical Enquiry into the Origin of our Ideas of the Sublime and Beautiful, (1757), ed. Adam Phillips, (Oxford: Oxford University Press, 2008), pp. 55-56. Katie Trumpener, Bardic Nationalism: The Romantic Novel and the British Empire, (Princeton: Princeton University Press, 1997), p. xi. Originally hailing from Swansea in South Wales but now based in England, Katherine recently completed her doctoral research in the Faculty of English Language at Literature at St John’s College, University of Oxford. Her thesis focused upon her conception of the “Bardic Sublime” in eighteenth-century and Romantic period poetry. She previously studied at Pembroke College, University of Cambridge, where she completed an MPhil. in Eighteenth-Century and Romantic Studies, following an undergraduate degree in English Literature at the University of Warwick. She was formerly a convenor of her Faculty’s interdisciplinary Romanticism Seminar – ‘Romantic Realignments’ – at the University of Oxford, and has previously collaborated with the Ashmolean Museum in order to explore conceptions of the Bardic Sublime in relation to the verse and art of William Blake. This entry was posted in 18th century, 19th century and tagged Bard of Snowdon, English language, English literature, Poetry, Welsh bard, Welsh literature, Welsh poetry. Bookmark the permalink.